Sinarid Capsules are herbo-mineral anti-allergic, which is effective in allergic sinusitis, headache, allergic rhinitis, fever, etc. 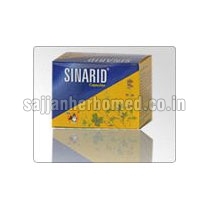 Our company is a distinguished Supplier of Sinarid Capsules from Punjab, India. These capsules are effective in combating face allergen attacks without any side effects. Accurate composition, zero side effects and high effectiveness are some of the attributes of our Capsules. Buyers can purchase Sinarid Capsules in sterilized packaging options at industry-leading rates. Rhinitis, Acute or acute-on-chronic Sinusitis, Rhinitis, Anti-inflammatory, Increases appetite and digestion, Produces a feeling of well being, Fever and body ache.